I came back to my home County of Dorset, England, to help my parents celebrate their 50th wedding anniversary. We haven't actually had the celebration yet, and hopefully we won't all kill each other before Saturday :-). Yesterday we took a trip to Dorset's Jurassic Coast, named for the many fossil discoveries on the naturally pebbly beaches and chalky cliffs. We started in the small seaside town of Lyme Regis, made famous by Jane Austen, as well as the novel/movie The French Lieutenant's Woman. Doesn't matter - these grassy-topped white cliffs dropping off into the blue green waters of the English Channel are breathtaking. After hanging around in windy, rainy Lyme, we drove over to Lulworth Cove, a tiny village nestled between the cliffs. A long and steep up & down climb takes pedestrians (only - no cars, horses, bikes, skates, etc.) to the secluded Durdle Door, which boasts a landform whose picture usually makes it to college Geology books. Ok I have family stuff to see to now so I can't hang about, and I don't have time to put in links. But a google image search on some of the above names should do it if you're remotely interested. However, save your time and just come over and check it out for yourself. The heck with London! Come to the Dorset coast for a whole different English experience. My Dad drove us to Stone Henge today and all I could think about was the dwarf on stage in the Spinal Tap movie dancing around the incorrectly scaled Stone Henge. A few days ago at Corfe Castle (google), all I could think about were cows being catapulted over the wall. But Monty Python and the Holy Grail aside, it doesn't get more quaintly English-villagey than Corfe or Lulworth. Most of the buildings there were established when being 5 ft 8 meant you were a giant. Sadly these days you can't climb around on the Stones at Stone Henge thanks to idiot vandals. You have to stand there and look from afar. I could make a great report out of all this but there's so much to write about, I'd never get it done, so here's a snippet to whet your appetite. Speaking of which, if you come over to the UK let me give you a list of all the best junkfoods to buy. The doner kebabs are mouthwatering. Oh and forget about salt-n-vinegar chips - go for the prawn cocktail crisps instead! OK gotta go cook bangers 'n' mash for the family. Double Decker Bus Tipped Over! Submitted by eebee on Thu Jul 31 2008 7:37pm. Well the bangers weren't a hit with my half-ish American kids. The clotted cream and strawberries, however, went over very well. Clotted Cream: the cream scraped off the top of scalded whole milk. I was going to mention in my previous post that there is a red double decker open-aired bus number 50 that leaves from Bournemouth in Dorset, and weaves through Branksome Chine, where we picked it up 3 days ago. The red bus topples its way through the narrow local streets here, down steep hills and around tight bends, tree limbs slapping those upstairs screaming with the wind in their hair roller-coaster style. I'm glad we took that bus Monday morning instead of Thursday morning! 3 days ago on our trip it was cram-packed because of the glorious weather. Today it was cooler, overcast and rainy, and so there were half the number of people on that bus. It's a fun public (Wilts and Dorset) bus ride which takes you down the street where John Lennon bought his Aunt Mimi a house once he'd hit it big (the small bungalow was replaced by something more flashy in recent decades), to the good ol' Sandbanks ferry across the mouth of Poole Harbour. If you didn't take the 15 minute ferry crossing, it'd take a good hour to drive around the back of the harbour to get across to the Isle of Purbeck, and Studland. Incidentally, there is a nudist beach at Studland (stifled giggles). The bus lumbers onto the chain ferry, along with other lower priority vehicles, pedestrians and cyclists. 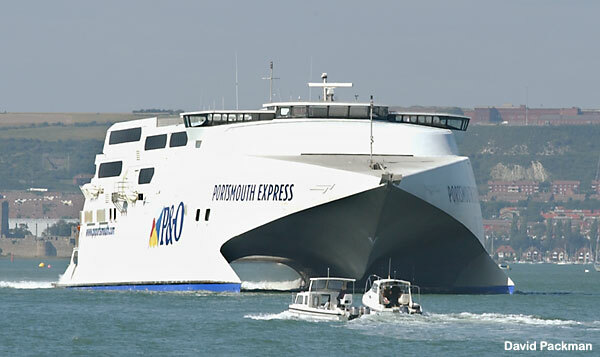 The ferry makes its crossing, perhaps having to stop to let a Condor Ferry "Fastcat" catamaran (huge boat on two fins with a hole where the bottom of the ferry boat usually goes) pass through on its way to France or somewhere. Once on dryland the other side of Poole Harbour, the bus seems more stable in the absence of buildings, as Sandbanks and Studland are in protected areas and are free from hotels or other touristy buildings that multiply like rabbits. Studland's sole black tarmac road leading from the ferry is flanked by deep green gorse dotted with purple heather, with a sand dune here and there. You can stay on the bus all the way to Swanage, where you can take the steam train to Corfe Castle (ruins) or watch Punch and Judy on the beach: "Oh no it isn't...oh yes it is...". On the way back home again via the same red double decker open-aired bus number 50, the narrow roads for the Studland day trippers rapidly fill up with cars in queue for the Sandbanks Ferry back to Poole. Our bus driver calmly pulled out into the oncoming traffic lane, giving a light and breezy tap on the horn to warn anybody coming in the opposite direction that they'd better pull over or they'd collide head on with a huge bus and probably lose. I wondered how the poor car drivers coming the other way felt about it, as I didn't see any such warning when we landed that side of the ferry. I felt like I was on a fire truck or the lead paceline for A2A as traffic parted on both sides for us to pass through at our own speed. We stopped at the water's edge, first in line to catch the ferry. Cool deal! My sister told me they even hold the ferry up if there's a # 50 bus coming, and will make the other cars clear room for it to catch the ferry so that the bus can stay on schedule. What a way to travel! From my perspective at the top of the bus, I was certain we were gonna cream some cyclists and pedestrians at the rate we swung round some of those street corners. I reassured myself that it was all a matter of trompe l'oeil, and that no double decker I'd ever been on had ever wiped anybody out, and the only one I'd ever heard or seen tipped over was during that bout of inclement weather last winter in the UK. Still, this didn't stop me from my usual paranoia of wondering who I'd try to save first if the whole ferry rolled over, dumping the bus into the Harbour: I'd make sure my kids were above water, let my sister worry about her kids, and then I'd go try to free my parents from downstairs on the bus, who'd surely be stuck, arthritic knees and all. Never mind that I can hold my breath for only 6 seconds and don't know how to dive. So the bus trip to Swanage came and went and a good time was had by all and we all got sunburned. 3 days later we turn on the news to find a local in a nice black Porsche decided he'd try to play chicken with the oncoming red double decker open-aired number 50 bus as it careered towards the Ferry. The Porsche is totalled and the bus ran off the narrow road, tipped over and launched the 15 upper deck passengers to safety into the gorse and heather bushes. The news report I linked to mentioned reckless driving on the part of the Porsche driver, as do the reader comments. However, had it been me driving, I'd have been shocked to see the bus coming towards me in 'my' lane and I would have expected it to stop, as I do not recall seeing any signs that big red double deckers had priority, even in the wrong lane going in the wrong direction. Nobody died, thankfully. Submitted by Jack on Fri Aug 1 2008 11:45am. Great read. I've been to England twice and loved it. Ok, the food is a touch on the bland side, other than that, beautiful country and wonderful people. Missed you on the skride last weekend and look forward to our next outing. Are you, can you, skate any over there? Maybe you were up north? Submitted by eebee on Fri Aug 1 2008 4:34pm. Although the Poole area is an old coastal resort town gaining popularity amoung young millionaires, I don't see the skater or 'rollerblade' culture here like they have in Miami or Venice Beach or San Fran. However, I see cyclists by the peloton-load (all of them helmetless and dressed for office work), as well as skateboarders using their vehicles to get from A to B, often with purple hair. Very cool. Pedestrians have the right of way in the ped zones of course, so cyclists have to break or slow down. I have been enjoying a gastronomical trip down memory lane via treats my taste buds had long forgotten. This is probably just as well. I will have to load up any future paceline buddies with 15 lb of chocolate in their backpacks & jersey pockets so they can hang back with me. After much agonizing I decided to leave my skates at home in the US because I couldn't stand the thought of Delta losing them, and I correctly assumed my time would not be my own due to family obligations. However, I did get to race my 12 year old nephew up the cliffside at Durdle Door. He won. Submitted by Jack on Fri Aug 1 2008 11:03pm. I was at Saunderton, near High Wycombe. This was in 1987 and admittedly I wasn't very adventuresome when it came to restaurants, pretty much going where the rest of my classmates (Molins Machine PLC) went. It would be lovely, however, to do a few trips up and down Durdle Door, looks to be a real lung and quad buster, in my new trail shoes, New Balance 874s, very grippy and lightweight. Tell your nephew not to ply his auntie with the goodies prior to anaerobic challenges, very sneaky :-) See you soon. Submitted by eebee on Sat Aug 2 2008 8:21am. Well High Wycombe is about 20 miles from where I lived in 1987 before I took off for Germany. Who knows? Maybe we even passed each other on the street! I could have used your new grippy shoes, Jack. As it was I had to wear my sister's (bigger) Mizuno volleyball shoes to walk in because my nu shooz had given me awful blisters. Note to self: next time buy the shoes 2 weeks before the trip and practice walking about 3 miles a day to get used to them. 87 miles in Verduccis in one day with no blisters can lull you into a false sense of tough-footedness. Getting around in England is next to impossible if your pinky toes are so painful you just want to amputate them. I wish I could pay for all my friends to come over here and give you all a guided tour. Rick Steves eat your heart out. Have a great T2T training ride today. I wish I could be there, too! Awesome Stuff. Give Us More! Submitted by roadskater on Thu Jul 31 2008 10:12pm. Hey that's great stuff. It'd be fun to add some of the locations in too, and I'll be glad to help. I just want to make sure I don't erase the UK flag by editing...I'll have to make note of the IP and such. You know me I love those map pins! I have email text I can return of some of the exploits. This is all stuff we can't see on our television no matter what, even in the PBS travel series, as they just don't get to real life somehow...too little time, perhaps. Thanks for sharing the things that resonated from childhood and now. Submitted by timv on Sun Aug 3 2008 7:38pm. The cultural references were fun and it was easy enough to hit Google Maps to see just where you were talking about. I guess Brighton's an hour or so away, but I'd surely be climbing on a big rock and waiting for the tide to come in, laying back on it and singing "the beach is a place where a man can feel/he's the only soul in the world that's real" and "love reign o'er me." Submitted by eebee on Mon Aug 4 2008 12:08pm. Thanks Timv! I do feel strange though, as if a large part of me I had forgotten existed reaches towards the rain and pedestrain lifestyle like green shoots emerging from retreating permafrost. It's oddly reassuring to realize just how very disorient(at)ed I've been these 11 years away from the UK/Europe. I could not survive in the US without skating! Brighton's not far at all. The Germans love it, for some reason. Submitted by MikeB on Wed Aug 6 2008 2:13pm. I'm looking all over the place on-line but can't find where to register for the Tour de Dorset. Bloody Hell. Too bad too, I bet it would have been a jolly good skate. Submitted by eebee on Wed Aug 6 2008 2:37pm. Well if you're into fell running, or in this case, cliff running, you could try the Jurassic Coast Challenge, which takes place over 78 miles of cliff tops. Out of the 20 who started last year, only 5 were allowed to finish, having made the cut-offs. It sounds exciting to me, all except having to negociate the cliffs in the dark with a flashlight! There are no fences, walls, or barriers to stop someone from falling (or jumping!) off to the rocks below. Submitted by MikeB on Wed Aug 6 2008 2:49pm. C'mon, there's such a thing as the Jurassic Coast Challenge? I thought you were pulling my leg, but sure enough there it is - 78 miles on foot in 24 hours over that terrain? That's nuts. Submitted by eebee on Wed Aug 6 2008 3:01pm. Come to think of it, I could have used such a cliff during last year's BikeStock in Mt. Airy. I'd have considered jumping off because of pain and discomfort from the gatorback road over the Virginia State line.